When I was a kid, I loved the Phantom. He was a weird combination of Tarzan and Batman. I loved stories about the previous generations of Phantoms. I especially loved stories about the female Phantom and pirates and the contemporary Phantom going out into the world in a hat and trenchcoat as Mr. Walker. I thought the Ghost Who Walks was a great name, and I loved the horse and dog, and I admired his independent girlfriend. But as I grew older, I realized the world had become too small for The Phantom. He was created in the 1930s when it was easier to believe in mysterious African nations and well-meaning white guys who were a little better than everyone else. He doesn't work in the 21st century. There've been attempts to update him—in some versions, he can turn invisible, and in others, he has a super-high-tech suit that deflects bullets. Those attempts lose what made him cool: he was a guy who got by with his wits, skills, and aura of mystery, and who could die because he was only human, but when he was wounded or killed, someone else would take his place so the legend never died. 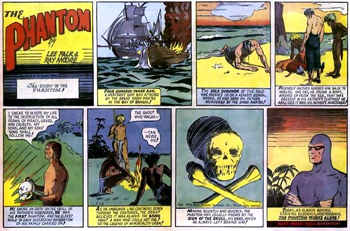 My reboot would start faithfully with the first Phantom's story: an Englishman is set upon by pirates, washes up on the African coast, is saved by the Bandar tribe, and becomes the Phantom. But that first Phantom would be the last European in the Phantom line. The first Phantom would marry an African or Arab woman, and each subsequent Phantom would marry someone from Africa, Asia, or the Middle-East, so the Phantom line would quickly be as multiracial as it could possibly be. The role of the Phantom would always be shared, sometimes by The Phantom's children, sometimes by The Phantom's friends, sometimes by The Phantom's lovers, so the stories whispered around the world about The Phantom could never agree: Is he a man as pale as death? Is she a woman as dark as night? Is the Phantom a giant, a midget, fat or thin, old or young? The answer would depend on The Phantom the storyteller had met—every age would have its primary Phantom who lives in the land of the Bandar, but The Phantom's family would travel the world, studying new ways to be more effective mysterious protectors. Rather than make The Phantom science-fictional or fantastical, I would keep the pulp roots by making The Phantom a highly-trained detective, martial artist, and marksman—I'd always thought the weapons were cool, especially when they changed with the times, from the first Phantom's cutlass and flintlock to the current Phantom's twin .45s. My contemporary Phantom would carry something like a commando knife and a Taser. As for the costume, the only change I would make would be to get rid of the striped trunks. Without them, it's basically a ninja suit, and that's perfectly reasonable for someone called The Phantom. The stories would occur anywhere on the globe. The focus would be contemporary, but there would almost always be a flashback to a previous Phantom who was involved in something that has some bearing on the contemporary story, which could range from an ancient stash of jewels or weapons to an ancestor of someone important in the 21st century story. Ah, well, Enough fanboy indulgence. With the popularity of superhero movies, I'm sure someone's trying to do a reboot of The Phantom. Here's hoping it's good. @WillShetterly Flashback to the original & to a previous Phantom who failed? That works but the Phantom lacks one thing: an iconic opponent. ETA 2: Forgot to include this: The Phantom should only appear in the Phantom suit when engaged in an operation where a stealth suit is required. The silliest part of current Phantom stories is keeping him in the suit all the time. Which may mean breaking one of the cool things I liked about The Phantom, that his face was never seen completely uncovered. But if you wanted to preserve that aspect of the original version, keeping the Phantom in a hat or hood with sunglasses would be easy. 1. Idealistic American aware of his immigrant roots. 1. Defender of social hierarchy. 2. Vigilante obsessed with violent property crime. 2. Visitor to a strange capitalist land. 3. Protector, especially of social outcasts. I'm happiest with the Superman hierarchy and least happy with the Wonder Woman. She's never been as clearly defined as Superman or Batman; my hierarchy is an attempt to be faithful to her creator's version of her, but I agree other approaches could be just as valid. The Batman hierarchy got the most discussion. The benevolent billionaire can be interpreted in so very many ways. I would write him as a modern version of a feudal lord who does not want the peasants mistreated but has no interest in ending feudalism—essentially, a good Republican/right-libertarian. My favorite comment was Murray Lindsay's: "It's been my melancholy realization in recent months that Superman with all his powers is no longer the unbelievable aspect of the character. That's been overshadowed by the concept of Clark Kent being an "investigative journalist/reporter" that actually digs up facts, flips over rocks and types up "news". Those beings seem to be extinct in the 24 hour infotainment news cycle.﻿"
Superman's motto is a hierarchy: Truth is first, justice is second, the American way (as ideal, not reality) is third. He's no jingoist. I often notice classism in antiracists and antisexists. The most basic form involves being mistaken for clerks or waiters: "OMG, they thought I was one of the help! It was clearly because of my race/gender/both!" Being a white guy who has worked as a clerk and who has periodically been mistaken for one, my white male privilege lets me know the people who asked me if I worked there were simply looking for help and I was the nearest person dressed in a way that suggested I might be able to provide it. But for insecure privileged people, being mistaken for a mere worker is a great insult. 1. He did not grow up speaking pidgin. 2. He is not descended from Asian American workers who spoke pidgin. Chu appropriates pidgin to mock Sunkara, the "white man" he believes he is addressing in that tweet, by mocking the speech of working-class Asians. He asserts his superiority to the "white man" by taking on a cartoonish version of the language of people he sees as inferior, the poor workers who learned an English dialect by ear because they could not afford schools that taught the rules of middle and upper class English. His intended humor comes from the fact that he does not actually speak pidgin—he is asserting his superiority by suggesting the "white man" he is addressing is foolishly expecting him to speak like an inferior. Now, you may say I'm reading too much into Chu's use of pidgin, but note the context: Sunkara is saying class should be the primary concern of people who care about racism and sexism because women and people of color are disproportionately harmed by the US class system; Chu is rejecting that. Ah, well. Chu is hardly the only privileged person concerned with the ways racism and sexism affect his privileged peers who feels no need to put class high in his priorities. For privileged antiracists and antisexists, equality is about the opportunity for rich women and people of color to exploit workers of all hues and genders with the same freedom that rich white men have always had. The important clause there is "If the proletariat during its contest with the bourgeoisie is compelled, by the force of circumstances, to organise itself as a class, if, by means of a revolution..." That's not a call for revolution. That's saying that if and only if the bourgeoisie prevents the working class from gaining its power through the democratic process, revolution will be necessary. ETA: The other important clause: "...to wrest, by degree, all capital..." Marx was an incrementalist. As for Marx's mention that some socialists would turn the world in one huge barrack or workhouse, that's the goal of all capitalists—the nicer ones simply want nicer workhouses. Marx's libertarian socialism had no room for authoritarian or hierarchical socialists. Now, it's not surprising that Chu would put class low in his priorities. Asian-Americans, like Indian Americans, are more economically privileged than ethnically-Christian white Americans, thanks to coming to this country with proportionally more wealth as mandated by the immigration laws of the time. ETA 2: To be clear, it's the Asian-Americans of the second wave of immigration who came here with more wealth and/or the education for a better job than the average white, black, or Hispanic American. Wikipedia says Chu's parents were Taiwanese, and he attended Swarthmore, one of the "Little Ivies". Blogger hasn't been notifying me of all the comments left here, so I fear I've missed some. Since I seem to discuss blog posts more on Facebook and G+ than here, I'll simply turn off comments now. Apologies to anyone that inconveniences. North Shore town bans Bent Paddle beer over PolyMet fight - StarTribune.com: "The action came after the craft brewery joined a business coalition opposing PolyMet mine." You can adjust any of the assumptions for the sake of your story, of course. Anti-voting and third-party socialists, your argument has always been that it's impossible for socialists to compete in the two-party system. Until this year, I've agreed with you, but now the US is finally testing that theory. If Sanders fails, you will win new converts—see Poll: 33% of Sanders Supporters Wouldn't Vote for Clinton: "A new Wall Street Journal/NBC News poll indicates one third of Vermont Senator Bernie Sanders' supporters cannot see themselves voting for Hillary Clinton in November." But a surprising number of them will go to Trump because they see him as the only other politician who cares about the working class—see The Bernie Sanders voters who would choose Trump over Clinton | US news | The Guardian: "In an NBC News/Wall Street Journal survey conducted by Hart Research Associates this month, 7% of Sanders voters said they could see themselves supporting Trump." Backing Sanders now will make you more visible to his fans who wouldn't vote for Clinton. And if you manage to make Sanders do even better at the moment when the Democratic leadership betrays him, the betrayal will be magnified, and even more people will see the hypocrisy of the capitalist pseudo-left. What's the worst that could happen? If he actually wins with your help, the working class ends up with a $15 minimum wage, free public higher education, and a President who is less hawklike than any of the other viable contenders. None of that stops you from continuing to fight the good fight. That Shirky doesn't recognize Jealous's name is no big deal. That Shirky uses him as an example without bothering to see who he is? Priceless. Socialists debate whether Bernie Sanders is a true socialist. Does working with capitalists make him a capitalist? Does his support for Scandinavian-style social democracy make him a capitalist? His socialist critics don't ask this: If he's not a socialist, why has he called himself one since the 1960s, when the Red Scare had barely started to fade? Atheists are still more popular in the US than socialists. George Orwell could call himself a democratic socialist because the word had less stigma in England. Martin Luther King rarely mentioned his belief in democratic socialism because he knew the label made his work harder. Yet Sanders is a public socialist in the US Senate, aka the Millionaire's Club and America's House of Lords. He fits in oddly: he comes from the working class and he's no millionaire. He originally wanted to run for President as an independent, but his advisors convinced him that if he wanted media attention, he had to run as a Democrat. Even so, he continues to call himself a democratic socialist. In the US, socialists can be divided into three groups based on their attitude toward participating in elections: revolutionaries, third-partiers, and pragmatists. Thinking men of all classes begin to see that a new line must be struck out, and that this line can only be in the direction of democracy. But in England, where the industrial and agricultural working class forms the immense majority of the people, democracy means the dominion of the working class, neither more nor less. Let, then, that working class prepare itself for the task in store for it, — the ruling of this great empire; let them understand the responsibilities which inevitably will fall to their share. And the best way to do this is to use the power already in their hands, the actual majority they possess in every large town in the kingdom, to send to Parliament men of their own order. [...] Moreover, in England a real democratic party is impossible unless it be a working men's party. Ask revolutionaries when the Revolution will come, and they have no answer. Third-partiers may remember Engels's advice, but they fail to see that English and American democracy are different. The US's two-party system requires an issue as great as slavery for one party to replace another. Third-partiers struggle bravely, treasuring every minor office they win and dreaming that someday they'll take the national stage. Ask third-partiers when they will elect a President, and they have no answer. With that decision, he completed his lifelong journey from third-partier to pragmatist. But the Democratic Party is not a working class party—it's the party of the liberal one-percent. Given Sanders' acceptance of the Democratic Party's limits, is it still right to call him a socialist? If you think a socialist should call for nationalizing all big business, the answer is no. The closest Sanders comes to being a socialist now is believing the government should direct money toward the working class instead of the rich. But if you think a socialist should be constantly pushing the country toward socialism, the answer is yes. Sanders' platform is for social democracy, but in a land ruled by neoliberals, that's movement toward socialism. 1. Raising the minimum wage: "The current federal minimum wage is starvation pay and must become a living wage. We must increase it to $15 an hour over the next several years." 2. Providing universal health care: "The only long-term solution to America's health care crisis is a single-payer national health care program." 3. Providing free higher education: "Bernie Sanders will fight to make sure that every American who studies hard in school can go to college regardless of how much money their parents make and without going deeply into debt." 4. Giving the countries of the Middle East more responsibility for their military affairs: "I find it remarkable that Saudi Arabia, which borders Iraq and is controlled by a multi-billion dollar family, is demanding that U.S. combat troops have ‘boots on the ground’ against ISIS. Where are the Saudi troops? With the third largest military budget in the world and an army far larger than ISIS, the Saudi government must accept its full responsibility for stability in their own region of the world." 5. Ending the Israel-Palestine conflict: "...while recognizing that Israel has the right to defend itself, he also strongly condemned Israeli attacks on Gaza as disproportionate and the widespread killing of civilians as completely unacceptable. The U.S. must play a leading role in creating a two-state solution, which will require significant compromises from both sides. The Palestinians must unequivocally recognize Israel’s right to exist, and hold accountable those who have committed terrorist acts. The Israelis must end the blockade of Gaza, and cease developing settlements on Palestinian land. Both sides must negotiate in good faith..."
For more of Sanders' positions and how he would pay for them, see Issues - BernieSanders.com. There is another issue socialists debate: How would Sanders treat Edward Snowden? Sanders has said he deserves "clemency or a plea agreement that would spare him a long prison sentence or permanent exile from the country whose freedoms he cared enough about to risk his own freedom." Do I expect to make any socialists change their mind about Sanders? Sadly, no. But if anyone knows a better way to help America's working class next year, please let me know. Among the many things that invariably amuse me is the charge that if you support a candidate, you must support everything that candidate supports. It would mean that we would only have elections when the candidates were saints or our clones That's not how representational democracy works. I'm also amused when socialist elitists talk about the people's will and assume the people are fools. It is significant that Zionists prefer Clinton and the Muslim-American community overwhelmingly prefers Sanders. And any intellectually honest person who talks of Snowden would mention that Snowden prefers Sanders. My suspicion is you make enough money that you can sit on the sidelines and comfortably quibble. It is not a luxury that the working class has. You may've noticed the people making a statement in Chicago tonight. You may've even noticed who they support. My favorite Upton Sinclair applies to socialist elitists too: "It is difficult to get a man to understand something, when his salary depends upon his not understanding it!" Clinton is strongest when she's dealing with empty identitarian rhetoric. Sanders is strongest when he's pounding the class issues that unite us against the oligarchy. He doesn't need the black bourgeoisie and probably can't win them--they allied with the white bourgeoisie before slavery ended. He needs the black working class, and they understand that there's no social equality where there's no economic equality. I've been thinking about equality and feminism and how Hillary is replacing Obama as the face of the establishment. When I was young, we used to talk regularly about The Man, because the ultimate power was male and usually white. People haven't been using that term much. I suspect they began to see its weakness when Maggie Thatcher and Ronald Reagan began meeting as equals to plan new horrible things to do to their poorest citizens. A very short definition of "identitarian", a note about Sheepdog Theory and Bernie Sanders, and misc. Identitarian: someone who prioritizes social identity. For example, a Clinton supporter who says what's most important is that a woman win, even though that person claims to prefer Bernie Sanders' political positions. I don't believe in sheepdog theory. I think lesser-evilists will vote for the lesser evil, and the rest of us [socialists who support Sanders] will vote for 3rd party candidates or stay home. The nice thing about being a socialist is some things become very simple: work is work, no matter what the law or moralists think of it.